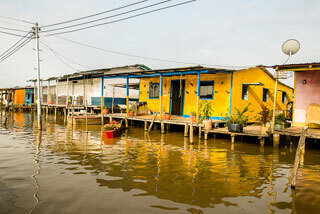 Legend has it that upon entering the lake Maracaibo, Ojeda's expedition found groups of indigenous huts, built over stilts on water and interconnected by boardwalks on stilts, with each other and with the lake shore. The stilt houses reminded Vespucci of the city of Venice, so he named the region "Venezuela," meaning "little Venice" in Italian. Examples of these stilts houes can still be found in "Santa Rosa", an area in the city of Maracaibo. This article uses material from the Wikipedia article "Stilt Houses of Maracaibo ", which is released under the Creative Commons Attribution-Share-Alike 3.0 License.